These ToU govern your use of Site and all services provided in connection with Site. If you do not agree to the then current TOU, please do not access or otherwise use the Site. These TOU may be updated by bullion.directory at any time in its sole discretion. Your continued use of Site will signify your acceptance of any change in the terms and conditions set forth herein. Bullion.directory may modify or discontinue the Site with or without notice to you and without liability to you or any third party. Bullion.directory is not responsible for the validity of the consumer complaints posted to the bullion.directory site. Bullion.directory in not responsible, in any way, for providing, or helping to provide, businesses’ responses to the consumer complaints that are posted on the bullion.directory site, and /or forwarded to businesses. Complaints posted to bullion.directory are a historical ‘snapshot’ of an ongoing situation, as seen through the eyes and perception of an individual consumer, often with incomplete or inaccurate information at their disposal. The point is, the consumer had a positive intent in writing their message; in helping themselves, in helping other consumers, in helping the subject business provide a better product or service. This positive intent, as perceived by bullion.directory, is an essential requirement for a consumer to post a message to bullion.directory. 2. Access to the Services. Subject to these ToU, bullion.directory may offer to provide certain services, as described more fully on the Site, and which are selected by you through the process provided on the Site (“Services”), solely for your own use, and not for the use or benefit of any third party. Services shall include, but not be limited to, any services bullion.directory performs for you, as well as the offering of any content on the Site. Bullion.directory may change, suspend or discontinue the Services at any time, including the availability of any feature, database, or content. Bullion.directory may also impose limits on certain features and services or restrict your access to parts or all of the Services without notice or liability. In using the site bullion.directory you certify to us that you are an individual at least 16 years of age. You also certify that you are legally permitted to use the Services and access the Site, and take full responsibility for the selection and use of the Services and access of the Site. These ToU are void where prohibited by law, and the right to access the Site is revoked in such jurisdictions. You also agree that you will comply with any local laws or regulations that may apply to your use of Services, including, without limitation, any laws requiring registration or filings with local authorities, and the payment of any taxes. You shall be responsible for obtaining and maintaining any equipment or ancillary services needed to connect to, access the Site or otherwise use the Services, including, without limitation, modems, hardware, software, and long distance or local telephone service. You are responsible for ensuring that such equipment or ancillary services are compatible with the Services. You agree that you will not request, contract with, pay, or otherwise attempt to influence any third party to access these services to manipulate or otherwise influence this Website in any manner, including, but not limited to, paying any third party to, or requesting that any third party, vote for any website linked to, reviewed or listed on bullion.directory. 2b. Fee-based Services Bullion.directory offers fee-based products and services. These fee-based services include on-site services, such as paid listings, sponsored posts and banner advertising, and off-site services such as website design, banner design, site management, affiliate management and marketing consultancy work. Bullion.directory reserves the right to change or remove a service at any time for any reason. Bullion.directory is not responsible to notify you when a service is changed or removed. 2b.i: Billing Services are typically billed in advance and must be settled in full ahead of handover, where a handover of a finished work is appropriate. In situations where fees are in relation to monthly billable hours, these must be settled in full ahead of the month in which the hours will be worked, unless agreed otherwise. 2b.ii: Ownership Ownership of all materials, including creatives, copy and coding remains with bullion.directory until such time as any outstanding fees are paid in full. 2b.iii: Discounts We may offer discounts on products and services. Discounts are offered at our discretion and are offered on the understanding of prompt payment. 2b.iv: Late Payment and Discounts In cases where payment for products or services is not received by the time it is due, we reserve the right to remove any discount and re-issue a second invoice for the full amount due without discounts applied. Where an invoice is unpaid 14 days past it’s due date and where the invoice includes discretionary discounts, any discounts previously offered will be automatically revoked and a new invoice will be issued for the full amount. 2b.v: Late Payment Interest Where an invoice remains unpaid 30 days past it’s due date, we reserve the right to charge statutory interest on the whole outstanding debt at 8%, plus the Bank of England base rate for business-to-business transactions. 2b.vi: Pursuit of Debts At 45 days outstanding we reserve the right to retain the services of a Debt Collection Agency and pursue the full amount outstanding, plus any interest. 3. Content of Opinions/Letters/Stories/Press Releases While you alone are responsible for the content of your messages, and the consequences of any such messages, you agree to abide by the guidelines below. Bullion.directory reserves the right to “remove your posting” on bullion.directory or “terminate your use” of bullion.directory if it becomes aware and determines, in its sole discretion, that you are violating any of the following guidelines. In writing reviews, Bullion.directory requires that any information posted by you regarding a company is truthful, factual, and represents an actual incident. Companies are protected by law from false claims against them. Your complaint could be construed as a claim about a company and may be subject to libel laws. Please verify that all information submitted is accurate and factual. As a user of the Site, you acknowledge that bullion.directory does not pre-screen or edit user authored content but that bullion.directory and its designees shall have the right, (but not the obligation) in their sole discretion, to edit or move any content that is available via the Site. Without limiting the foregoing, bullion.directory and its designees shall have the right to remove any content that violates the ToU or is otherwise objectionable. You agree that you must evaluate and bear all risks associated with the use of any content, including any reliance on the accuracy and completeness of such content. You acknowledge that bullion.directory may preserve your content and may also disclose content if required to do so by law or in the good faith belief that such preservation or disclosure is reasonable necessary to: (a) comply with a legal process, (b) enforce the ToU, or (c) respond to any claims that the content violates the rights of third parties. In the event that you post or make accessible communications or other materials that infringe the copyrights of a third party, bullion.directory shall take the actions described in copyright infringement policy pursuant to the Digital Millennium Copyright Act. You agree that you will not use Site for chain letters, junk mail, ‘spamming,’ solicitations (commercial or non-commercial) or bulk communications of any kind including but not limited to distribution lists to any person who has not given specific permission to be included in such a list. You further agree not to use this Site to send or post on message boards or any place on the Site, any message, material or user name that is unlawful, harassing, libelous, defamatory, threatening, harmful, vulgar, obscene, profane, sexually oriented, threatening, racially offensive, or inaccurate material of any kind or nature or that encourages conduct that could constitute a criminal offense, give rise to civil liability or otherwise violate any applicable local, national or international law or regulation, or encourage the use of controlled substances. Bullion.directory reserves the right to delete any such material from the Site and reserves the right to seek financial compensation from the promoted party/parties for this removal. You agree not to impersonate any other person or entity, whether actual or fictitious, including impersonating an employee or consultant of bullion.directory. You agree not to post or use the Site to distribute or send any illegal material of any kind, including but not limited to, illegal material in the form of text, graphics, video, programs or audio. Posting content or participating in any form of discussion with the intention to commit any illegal activity is strictly prohibited. Bullion.directory reserves the right to remove any reviews posted through proxy networks. Additional content restrictions are listed in our Content Guidelines document. 4. Ownership of Content The Site is protected by copyright as a collective work and/or compilation, pursuant to U.S. copyright laws, international conventions, and other copyright laws. Unless explicitly stated otherwise, you may not modify, publish, transmit, participate in the transfer or sale of, reproduce (except as permitted in this Agreement for the use of Services), create derivative works based on, distribute, perform, display, or in any way exploit, any of the content located on the Site (“Content”), materials, or Services in whole or in part. Unless explicitly stated otherwise, you may download or copy the Content, and other items displayed on the Site for download, for personal use only, provided that you maintain all copyright and other notices contained in such Content. You will not store any significant portion of any Content in any form. Copying or storing of any Content, where no express and explicit permission has been granted for other than personal, noncommercial use is strictly prohibited without prior written permission from bullion.directory, or from the copyright holder identified in such Content’s copyright notice. By submitting content, which shall include your member name, to any “public area” of Site, including message boards, forums, contests and chat rooms or by submitting content for transmission to a third party, you grant bullion.directory, its affiliates, and the parties to whom such content is addressed a royalty-free, perpetual, irrevocable, non-exclusive right (including any moral rights) and license to use, reproduce, modify, adapt, publish, translate, create derivative works from, distribute, communicate to the public, perform and display the content and any copyright rights, trademark rights, and other intellectual property rights contained therein (collectively, the “Rights”) (in whole or in part) worldwide and/or to incorporate it in other works in any form, media, or technology now known or later developed, for the full term of any Rights that may exist in such content. You also warrant that the holder of any Rights, including moral rights in such content, has completely and effectively waived all such Rights and validly and irrevocably granted to you the right to grant the license stated above. You also permit any user to access, display, view, store and reproduce such content for personal use. Subject to the foregoing, the owner of such content placed on Site retains any and all Rights that may exist in such content. 5. Registration and Password You are responsible for maintaining the confidentiality of your password. You shall be responsible for all uses of your registration, whether or not authorized by you. You agree to immediately notify bullion.directory of any unauthorized use of your registration or password. 6. Disclaimer of Warranties Bullion.directory makes no representations or warranties about the use, applicability, or performance of the Services or Content made available on the Site. 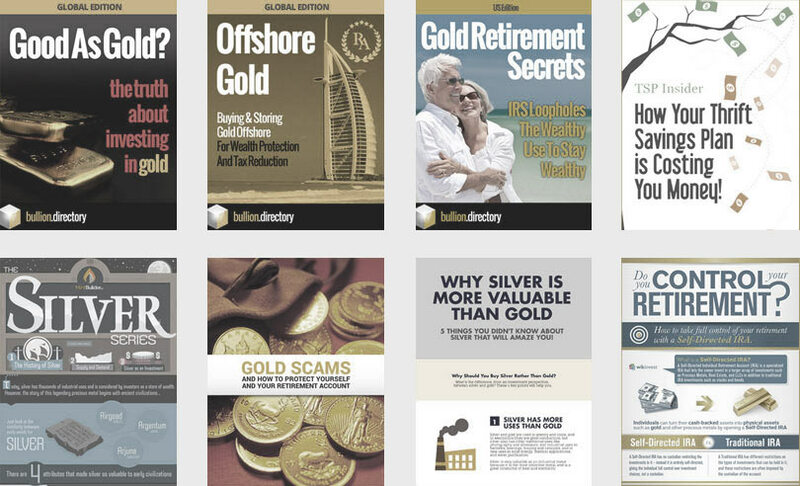 Bullion.directory has no special relationship with or fiduciary duty to you. You acknowledge that bullion.directory has no control over, and no duty to take any action regarding: which users gain access to the Site; what Content you access via the Site; what effects the Content may have on you; how you may interpret or use the Content; or what actions you may take as a result of having been exposed to the Content. You release bullion.directory from all liability for your having acquired or not acquired Content through the Site. The Site may contain, or direct you to sites containing, information that some people may find offensive or inappropriate. Bullion.directory makes no representations concerning any content contained in or accessed through the Site, and bullion.directory will not be responsible or liable for the accuracy, copyright compliance, legality or decency of material contained in or accessed through the Site. YOU ACKNOWLEDGE THAT THE SERVICES, CONTENT, AND SITE ARE PROVIDED ON AN “AS IS” AND “AS AVAILABLE” BASIS, WITHOUT WARRANTIES OF ANY KIND, EITHER EXPRESS OR IMPLIED, INCLUDING, WITHOUT LIMITATION, IMPLIED WARRANTIES OF MERCHANTABILITY, FITNESS FOR A PARTICULAR PURPOSE OR NON-INFRINGEMENT. SOME STATES DO NOT ALLOW THE EXCLUSION OF CERTAIN IMPLIED WARRANTIES, SO THE ABOVE LIMITATIONS MAY NOT APPLY TO YOU. BULLION.DIRECTORY MAKES NO WARRANTY THAT THE SITE WILL MEET YOUR REQUIREMENTS, OR THAT THE SITE WILL BE UNINTERRUPTED, TIMELY, SECURE, OR ERROR FREE; NOR DOES BULLION.DIRECTORY MAKE ANY WARRANTY AS TO THE RESULTS THAT MAY BE OBTAINED FROM THE USE OF THE SITE OR THE SERVICES PROVIDED BY BULLION.DIRECTORY. Bullion.directory will not be liable for the privacy of e-mail addresses, registration and identification information, disk space, communications, confidential or trade-secret information, or any other content stored on equipment, transmitted over networks accessed by the Site, or otherwise connected with your use of the Services. BULLION.DIRECTORY IS NOT RESPONSIBLE FOR THE CONTENT ON THE INTERNET OR WORLD WIDE WEB PAGES THAT IS CONTAINED OUTSIDE SITE. As a convenience to our members, we may provide links to resources which are beyond our control. We make no representations as to the quality, suitability, functionality or legality of any sites to which we may provide links, and you hereby waive any claim you might have against bullion.directory with respect to such sites. 7. Limitation of Liability BULLION.DIRECTORY SHALL NOT BE LIABLE FOR ANY DIRECT, INDIRECT, INCIDENTAL, SPECIAL, PUNITIVE OR CONSEQUENTIAL DAMAGES, RESULTING FROM THE USE OR THE INABILITY TO USE THE SITE, THE MALFUNCTION OF THE SITE OR SERVICES FOR THE COST OF PROCUREMENT OF SUBSTITUTE GOODS AND SERVICES OR RESULTING FROM UNAUTHORIZED ACCESS TO OR ALTERATION OF YOUR TRANSMISSIONS OR DATA, INCLUDING BUT NOT LIMITED TO, DAMAGES FOR LOSS OF PROFITS, USE, DATA OR OTHER INTANGIBLE, EVEN IF BULLION.DIRECTORY HAS BEEN ADVISED OF THE POSSIBILITY OF SUCH DAMAGES. SOME JURISDICTIONS DO NOT ALLOW THE LIMITATION OR EXCLUSION OF LIABILITY FOR INCIDENTAL OR CONSEQUENTIAL DAMAGES, SO SOME OF THE ABOVE LIMITATIONS MAY NOT APPLY TO YOU. 8. E-Mail Message Storage Bullion.directory assumes no responsibility for the deletion of or failure to store messages to companies. 9. E-mail Newsletter If you are a registered user and you have elected to receive our newsletter, bullion.directory makes no representation or warranty with respect to the content of any such e-mail newsletter messages or any goods or services which may be mentioned or linked to within our newsletter, and you agree that neither bullion.directory nor such third party shall have any liability with respect thereto. 11. Applicable Law These Terms of Service shall be governed by and construed in accordance with US and English Law, without giving effect to its conflict of laws provisions. Bullion.directory reserves the right to charge fees, surcharges and/or membership fees at any time. Inappropriate content: We will not tolerate threats, harassment, lewdness, hate speech, and any other displays of bigotry. Promotional content: We consider promotional content to be spam. Any commercial message will be removed with content reported to anti-spam organizations as being spam, which may or may not harm your future ability to comment an any Akismet protected website. Appropriate Reviews: Please make sure your contributions are relevant and appropriate to the site. For example, reviews aren’t the place for rants about a business’s employment practices, political ideologies, or other matters that don’t address the core of the consumer experience. Privacy: NEVER publicize other people’s private information. While some businesses may be identified by the people behind them, you should avoid posting other people’s full names, personal phone numbers and email addresses and we reserve the right to edit out any identifiable information. Intellectual property: Do not post content to this site unless you own the content in it’s entirety or are licensed to use the content, by the content’s owner. In posting content, we assume your compliance with this policy, as you must understand we can’t check all elements of all content for copyright violations. Personal experience: We only want to hear your firsthand consumer experience, not what you may have heard from other sources. When leaving a review, try to tell your own story without resorting to broad generalizations or allegations. Accuracy: Make sure your review is factually correct. Yes, voice your opinions, but never exaggerate or misrepresent your experience. Because we don’t take sides in factual disputes we expect you to stand behind your comments. Conflicts of interest: Your reviews should be unbiased and objective. For example, businesses and their employees shouldn’t write reviews about themselves or their competitors. We use technology and experienced manual review capable of catching false and misleading reviews. Any such reviews will be removed with the reviewers IP address being banned from future postings. We may also warn the business that their competitor appears to be attacking them. What if someone posted something false? Will bullion.directory remove it? We don’t arbitrate disputes, so in the event of there being a review which you feel is false or misleading you can post a public response in order to clear up any misunderstandings or to give your side of the story. When doing so please include your business name and the name of the reviewer in question along with a link to the problem review on our contact form.